Thanksgiving and Halloween themed cling stamps from Hero Arts designed by Kelly Purkey. Features a pumpkin, pumpkin pie, organizer, and the phrases "I heart leftovers", "family arrival", "give thanks", "grocery shop", "all together", "grocery list', "thanksgiving', "turkey time", "menu plan", "parade day", "me oh my, I love pie", "party! ", "buy candy", "bring treats", "get costumes", and "carve pumpkins". Cling Stamp from Impression Obsession featuring an Autumn country scene with a Pumpkin Cart. 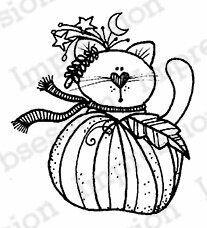 Impression Obsession cling stamp featuring a kitten in an autumn pumpkin. Perfect for Thanksgiving. Autumn themed Cling Stamp from Impression Obsession featuring fall pumpkins. 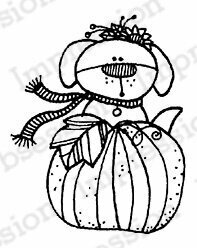 Impression Obsession cling stamp featuring a puppy in an autumn pumpkin. Perfect for Thanksgiving. Marianne Design Stamps Tiny's Autumn (Layering). This set of 12 stamps works togher to create four different fall elements: three leaves and an acorn. 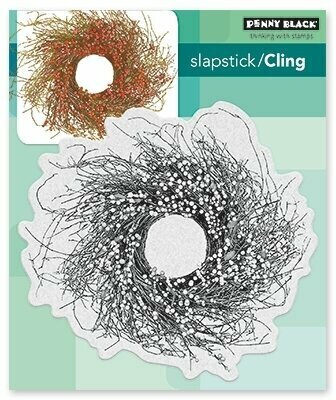 Use them together in autumn tones to create detailed designs perfect for fall. Size: 4.5 x 6 in.